The 2017 Future Policy Award was dedicated to policies that effectively address land and soil degradation, and the related risks to food security and livelihoods, and help secure a sustainable and just future for people living in the world’s drylands. 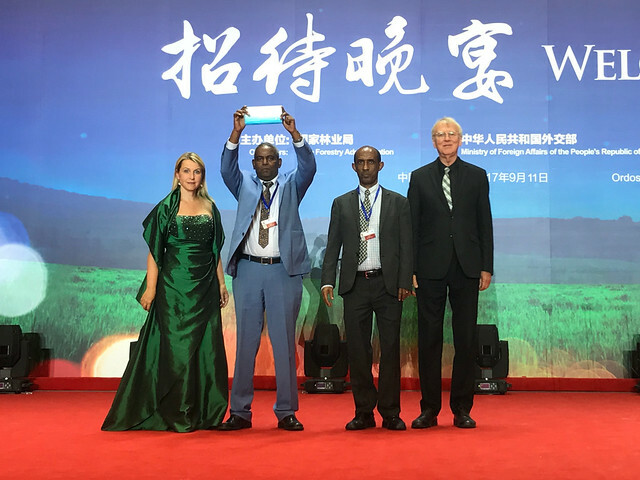 The award ceremony was held during the Opening Ceremony of the high-level segment of the 13th Conference of the Parties (COP 13) of the UN Convention to Combat Desertification (UNCCD) in Ordos, China. The Tigray region’s interpretation of Ethiopia’s development strategy focuses on food self-sufficiency and economic growth by conserving land and promoting sustainable agriculture. Thanks to a unique combination of collective action, voluntary labour and the involvement of youth, the people of Tigray are restoring land on a massive scale. This programme is a participative,bottom-up way to provide water for consumption and for growing food and keeping livestock in Brazil’s drought prone Semiarid region using simple rainwater collection technology. It empowers millions of the region’s poorest people to be in control of their own needs, to generate income and enhance their food security. 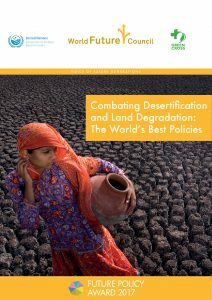 This is the world’s first integrated law dedicated to combating desertification. It provides a framework for China’s National Action Programme and a host of projects aimed at rehabilitating land at risk. Over the last 15 years, China has reversed the trend of desertification. It is no coincidence that the country lifted more than 700 million people out of poverty during the same period. This awareness raising, high-level political initiative communicates a new concept for mitigating climate change through the annual increase in soil organic carbon by 0.4 per cent in the top 30-40 cm of the agricultural soils. It encourages a paradigm shift in agricultural practice. Indigenous Rangers are at the forefront of turning around environmental degradation right across Australia. 75 Indigenous Protected Areas, covering over 67 million hectares, now make up more than 44 per cent of the National Reserve System and have created largest contiguous area of protected arid land in the world. Bedouin people in Jordan have governed their rangelands through their own land tenure systems and grazing rights known as “Hima” for millennia. The Rangeland Strategy embraces this traditional, holistic concept, which effectively integrates natural resources, community life, ethics, animal welfare and more. This is a large-scale, cross-sectoral initiative that is enhancing the sustainable agricultural development and socio-economic resilience of farmers and herders. The policy was developed in an inclusive and participatory process. Since 2011, Niger has reduced the proportion of people suffering from hunger by 50 per cent.